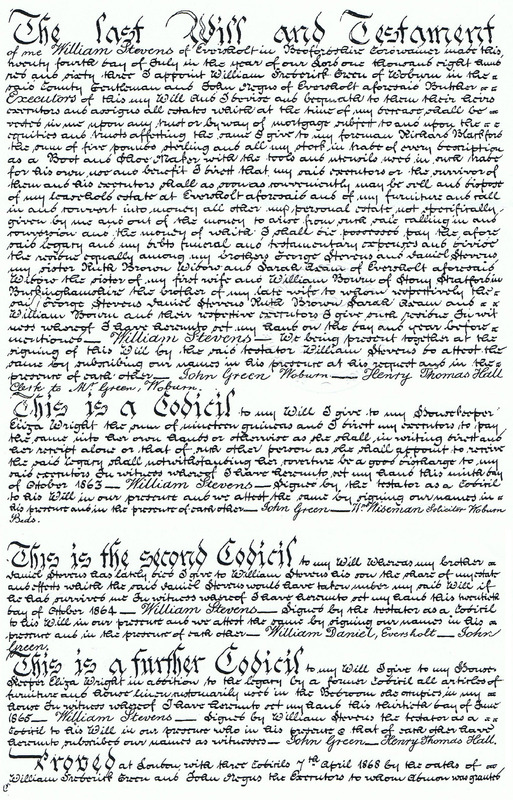 Mark Steevens wrote some of this page, donated most of the documents on this page, and inspired all the research for this page. He came to lunch here in Eversholt in Spring 2012, and we all had fun. Now in Autumn 2012, we hear the terribly sad and shocking news that Mark has died. He became ill at work and died shortly after. We’ve been sent this brief note about Mark by his family. A quiet man but not reserved, full of determination, enthusiasm and laughter. He saw problems as a challenge not a menace. He was gifted with an unassuming nature and never patronising he adored helping others not for adulation but simply the pure joy of making things right and better. He loved his work at the B.B.C. and his colleagues there who made it even better. With his great sense of humour his perfect day contained some form of playful banter and he had so many perfect days. As a founding member and Chairman of his beloved Anglo-Burmese Library (ABL) he used his phenomenal memory to help people with the gaps in their family history. His in-depth knowledge of an administration long since gone, as well its military history was a unique talent which he shared without reservation. As the Burma representative for the British Assoc., of Cemeteries in South-Asia (BACSA ) he was fulfilling his dream to ensure the graves and cemeteries of the past would be forever tended and treated with the respect they deserve. His life was full and he was so very happy. The Causeway This double cottage was the home of the Steevens family from the late 18th century through to 1868. On the death of William Steevens in 1868 the property was sold at auction and passed shortly afterwards to the Turvey family. William Steevens’ younger brother George Steevens enlisted in the East India Company’s Madras Artillery in 1824, invaded Burma (successfully), married a Burmese (or rather Mon) girl and had a large family of which I (Mark Steevens) am one of the latest examples. George died of old age in Madras in 1877. The family story is the stuff of epic dramas and tragedies, against a background of exotic kingdoms, omnipotent despots and the savage war against Japan. I am in the process of writing the screenplay, but there are concerns about the budget. Click all the pictures for bigger versions! Mark Steevens contacted Eversholt2 in 2012 to tell of his family’s history in Eversholt. On 21 May 2012, Mark Steevens came to visit Emrys and Sheila Williams and Robert Berkeley, and a fine time was had by all. He brought the pictures here to share. Thank you very much, Mark! [EJW writing this bit and below]. 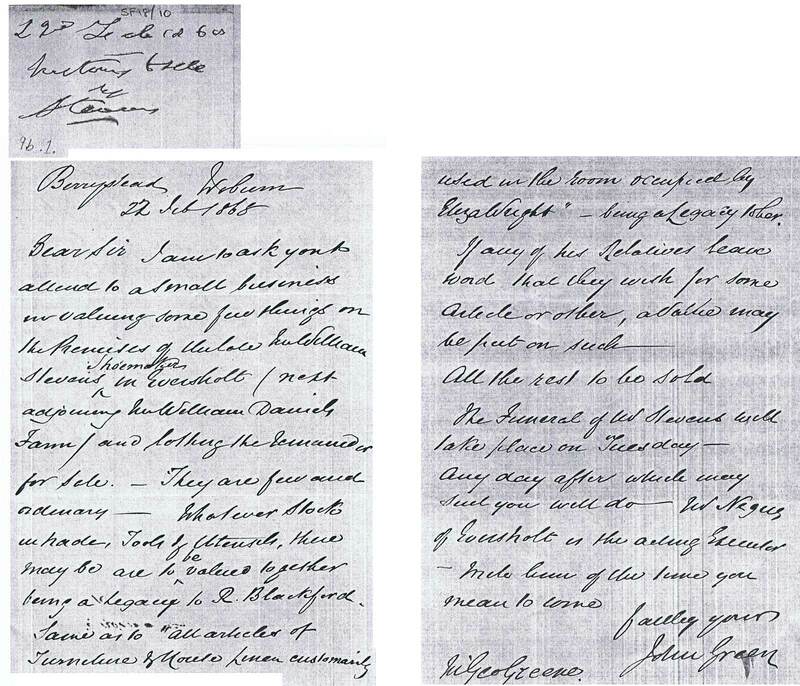 In all the documents below, there is confusion over spelling, some names being “Stevens” and some being “Steevens”. 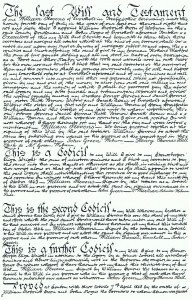 Mark Steevens points out that signatures of the literate members of his family always used a double E, while the names written down by clerks, or printed, for example in the poster below, tend to use a single “E”. So the true name of the family is Steevens, although mistakes are often made by those unfamiliar with the tradition. This is an advertising poster for the sale of The Causeway in 1868 after the death of William Steevens. 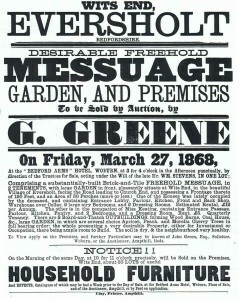 Desirable freehold messuage, garden, and premises, to be sold by auction, by G. Greene, on Friday, March 27, 1868, at the “Bedford Arms” Hotel, Woburn, at 3 for 4 o’clock in the afternoon punctually, by direction of the trustees for sale, acting under the will of the late Mr. Wm. Stevens, in one lot; comprising a substantially-built brick-and-tile freehold messuage, in 2 tenements, with large garden in front, pleasantly situate at Wits End, in the beautiful village of Eversholt, facing the road leading to Church End, and possessing a frontage thereto of 120 feet, and an area of 30 perches (more or less.) One of the houses was lately occupied by the deceased, and containing entrance lobby, parlour, kitchen, front and back shop, warehouse over cellar, 2 large airy bedrooms, and 2 dressing rooms. Estimated rental, £12 per annum.The other is in the occupation of Miss Keating, containing entrance passage, parlour, kitchen, pantry, and 2 bedrooms, and a dressing room. Rent, £5. Quarterly tenancy.There are 2 board-and-thatch outbuildings, forming wood barns, coal house, &c., large garden, in which there are several choice apricot, peasch and morella cherry trees in full bearing order; the whole presenting a very desirable property, either for investment or in occupation, there being ample room to build. The soil is dry, and the neighbourhood very healthy. To view apply on the premises, and further particulars may be known of John Green, Esq., solicitor, Woburn, or the auctioneer, Ampthill, Beds. On the morning of the same day, at 10 for 11 o’clock precisely, will be sold on the premises, Wits End, about 50 lots of useful household furniture and effects, catalogues of which may be had a week prior to the day of sale, at the Bedford Arms Hotel, Woburn, place of sale, and of the auctioneer, Ampthill, or by post on application. This is the catalogue of furniture and effects mentioned above. It amounts to an inventory of the house in 1868. Typing in that lot, or rather list of lots, will have to wait for someone more dedicated than I. But it’s clear that William Steevens was very comfortably off. Mahogany Pembroke table, two oak dining tables, two 4-poster beds… and a new parrot cage! I wonder what happened to the parrot? The sale documents mention a will, and Mark Steevens has found it. Since that’s a bit hard for the search engines to index, here’s a transcription. Wm. Wiseman Solicitor Woburn Beds. I am to ask you to attend to a small business in valuing some few things on the premises of the late Mr William Stevens Shoemaker in Eversholt (next adjoining Mr William Daniels Farm) and ?? the ?? for sale. They are few and ordinary. Whatever Stock in trade, Tools and Utensils, there may be are to be valued together being a legacy to R. Blackford. Same as to all articles of Furniture & House Linen customarily used in the room occupied by Eliza Wright, being a legacy to her. If any of his relatives leave word that they wish for some article or other, a value may be put on such. All the rest to be sold. The funeral of Mr Stevens will take place on Tuesday. Any day after which may suit you will do. Mr Negus of Eversholt is the acting executor. ?? him of the time you mean to come. This table gives lists all the entries in the register of baptisms on this site (up to 1812) for the name “Stevens”. There are no entries for “Steevens”, but the transcription process leaves a lot to be desired, so that’s not definite. This is all a bit confusing. Thomas “Stevens” seems to be happily producing children with Mary “Stevens”, and suddenly up pops one borne by Ann Stevens! Then two together with no mother listed. Did Mary “Stevens” die giving birth to twins? Then another mother, Frances “Stevens” – see below for more about her. 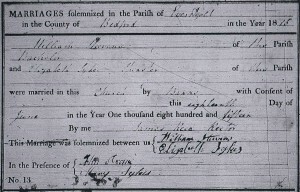 William Stevens, baptised in 1788, is the deceased who left The Causeway to be sold in 1868. George Stevens, baptised 1806, is his brother, and Mark Steevens’s direct ancestor, who went off to Burma. Here are the burials, and there was indeed a Mary Stevens buried some time before George was baptised. Just for completeness, here are the marriages.
. Original Original Extended Gregorian Groom Groom Groom Groom Bride Bride Bride Date wrong?
. date Calendar date day Name from occupation status Name From status licence Check original? Mark Steevens has located the marriage licence documents for Thomas Steevens and Mary Backhouse for 1787. There were real teeth in the sworn statements of eligibility for marriage. 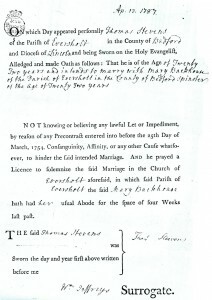 If it later turned out the bride and groom were not eligible to be married, Thomas Steevens and William Peneyfather [or Pennyfarther], who swore they were, would be liable to pay £100 to the archdeacon’s office. Since they were planning to be married in Eversholt Church, why aren’t their names in the register? Anyway, these were the parents of William Steevens, who was their first child. 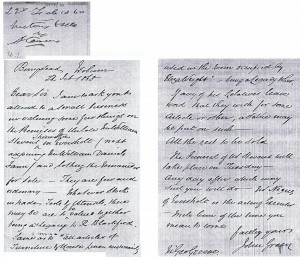 Thomas Steevens is spelt both “Stevens” and “Steevens” in these documents, but the signatures are always “Steevens”. Thomas Steevens remarried after Mary’s death. 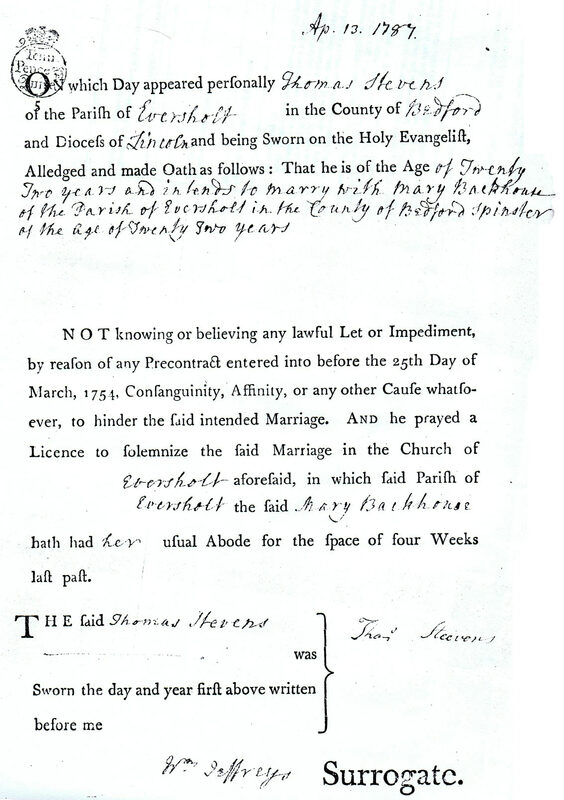 Here is his 1809 certificate of marriage to Francis [sic] Bright, Spinster of Eversholt. James Major and Sarah Major were witnesses. Thomas and Sarah both signed with a very neat hand, but Francis and James made a mark instead. They priest was John Sandys “Junr“, although this is followed by a word that is unclear. The official rector of Eversholt in 1809 was John Sandys, appointed 1766 and therefore getting on a bit by 1809 – he died in 1810. Another John Sandys, presumably his son, was appointed curate of Eversholt and later, in 1798, rector of Milton Bryan. So the son had probably come over from Milton Bryan for the ceremony. 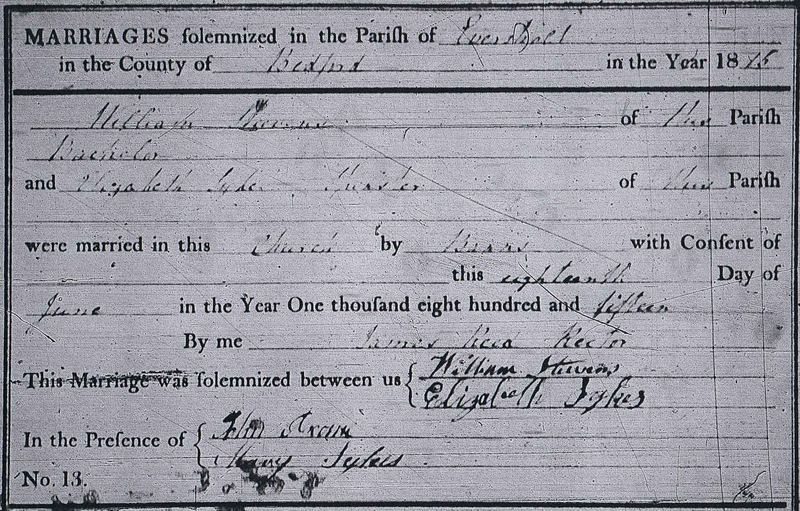 William Steevens was married in 1815, and we have his marriage certificate from Eversholt Church, courtesy of Mark Steevens! He married Elizabeth Sykes. John Axam and Mary Sykes were witnesses. Sorry, Ancestry.com login needed for many of these links below. In 1851, it’s not clear who, if anyone, lived in the smaller part of The Causeway, because the census records for Witts End are not in the obvious order. In 1861, Eleanor Fuller (or Ellen, depending on where you look) lived on her own in the smaller part of The Causeway. She was an infant school teacher, presumably at Eversholt School. She was born in Eversholt about 1813. In 1871, she had given up teaching to be housekeeper to John Peters. a retired farmer in Lower Rads End. In 1881, she was living off an annuity in Hills End, with Catherine Hartup, a 76-year-old lodger, and Laura Butler, a 13-year old boarder from Brighton. Is the difference between a lodger and a boarder that a lodger pays their own way, but a boarder is paid for by someone else? Eleanor died in 1888.
in 1851, she was living with her father, John Fuller, in New End round the corner, one of the houses associated with the Linden estate. I can’t find her in 1841, but I can’t say I’ve tried very hard! Ellen Fuller was infant school teacher as far back as 1847. She’s listed in the 1847 Post Office directory. “Miss Keating” is mentioned on the house auction poster as living in the smaller of the two houses that make up The Causeway. She was born in 1841 in Westminster, and taught at the school, according to the 1871 census. The census gives here name (just) as “Char L Keating”. There is a Charlotte Louisa Keating of the right age who married Abraham Pobjoy, a widowed tailor born about 1827, in 1877, in Battersea. That looks to be the right one, because there is exactly one baptism record for a Charlotte Keating around the right time, and that was for Charlotte Louisa Keating, born in Westminster, which matches the 1871 Eversholt census, and with father John Keating, which matches the 1877 marriage record. Charlotte and Abraham Pobjoy lived in Battersea, and Abraham died in 1892. It’s not clear what happened to Charlotte. “Miss Keating” is listed as schoolmistress in the 1876 directory. By 1877, she’s been replaced by Ellen Pepper. Back in 1869, it was Mary Armitage. So Charlotte seems to have been in Eversholt from between 1869 and 1871, to 1876. In 1881, William and Sarah E Attwood were living in the smaller part of The Causeway. Again, the house name isn’t given, but it seems to be the right house, right at the end of the Wits End properties, with the added check that Sarah Dewberry was living two doors along. She was the next-door-neighbours to the Harrises, in 1891. William Attwood was a “Sanitary Inspector School – Attendance Officer and Inquiry Officer” and Sarah was relegated to “Officer’s wife”. I mean, what further qualification could a women desire than to define herself as an “Officer’s wife”? Did they move in when Charlotte Keating moved out? They’d moved to Woburn by 1891. William’s occupation immediately throws up the vision of his colleague, the Insanitary Inspector. The 1891 census shows William G J Adkins living alone in the smaller part of The Causeway. He’s 43, unmarried, and does not state any occupation. By 1901, he’s moved up in the world, because, while head of the household, he gives his occupation as “Supported by wife”! [I’ve tried the same trick, but it doesn’t go down well – EJW :-)] His wife is Elizabeth, two years younger than William, and “Living on own means”. He was born in Tingrith, and she, Eversholt. Their distribution of income was apparently a sore point for them, too, since in1911, under William’s entry as head of the household, there’s Elizabeth’s entry also listing her as head of the household! Then some spoilsport has crossed that out and sniffily listed “wife”. They still have “independent means”. There are some other marks on the paper which might be fascinating if we could only read them! William G J Adkins was the son of the Adkins farming family of Tingrith, listed there in 1871. 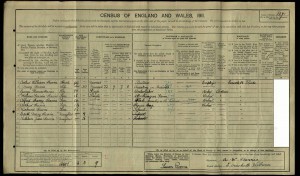 He was still living in Tingrith in 1881 (his age given on the various census forms is even more variable than usual). Elizabeth was another familiar name – Eliza Sibley. They married in 1892. William Steevens may have lived all his life in The Causeway, and may have inherited the building from Thomas Steevens, his father, who might have been living there since the 1700s. In 1841, he and Elizabeth are listed in Eversholt, but it’s not clear where. He’s a shoemaker. In 1851, he’s a cordwainer employing 3 men and 1 apprentice, living in Wits End. In 1861, he’s a master cordwainer employing 3 men. Elizabeth died in 1863, probably. William Steevens is listed (as “Stevens”, inevitably) as a shoemaker in the 1847, 1862 and 1864 directories. Throughout this time, his business has a competitor, John Gazeley of Rads End. In the 1869 directory, Gazeley is the only shoemaker in town. By 1876, Gazeley has become “Gazeley & Co”. 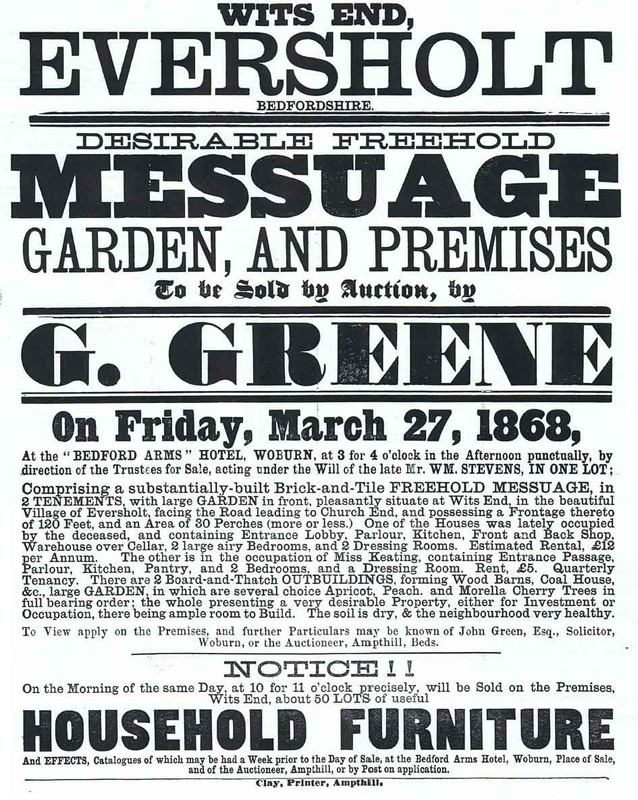 The 1877 directory has them listed as “Gazeley, George & Jabez”. Geroge Gazeley is making shoes in 1890 and Kohn Gazeley in 1898, but that’s the last [sorry – EJW] of the shoemaking Gazeleys. However, the 1903, 1910 and 1914 directories list Thomas Ireland of Rads End as Eversholt’s shoemaker. The 1871 census does not have full street address listed, only schedule numbers, but it usually is that the schedule numbers are in order, walking along the road. Next to Miss Keating is the household of Edward Fryer, 42, born in Dunstable. His occupation is plait dealer. He lives with his wife, Joyce, 38, and their two-month-old son, Edward Lewis Fryer (given as “Lewer” in the Fryer family tree on Ancestry.) Edward Lewis was born in Eversholt so was probably born in The Causeway. Were these the people who bought The Causeway at auction (yes – but I will need to find the document which proves it)? The notion that this is the right household is strengthened by the next household along, which is that of William Daniels, farmer, mentioned as next door neighbour in the letter from John Green above. Edward, Joyce and Edward Lewis Fryer don’t stay long. Strangely, Edward and Joyce seem not to be listed in the 1881 census, but Edward Lewis Fryer, aged 10, is definitely a boarder with the Allen family in Wingrave. He made his own way, for he was living with his family and working as a confectioner in 1901 and 1911. There are no obvious other records for Edward and Joyce, though, in 1881 or 1891. 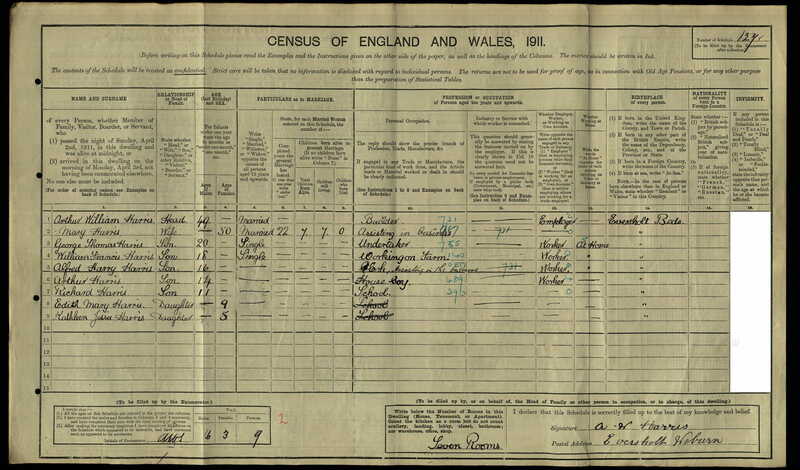 Edward doesn’t appear in any other census that I can find, before or after. Then, suddenly, in 1901, Joyce reappears in Linslade, a widow living with her daughter, Mary Fryer, who was born in Cranleigh, Surrey, about 1875. In 1911, Joyce is still going, still living with Mary, who has now married a taxman. There’s a likely birth record for Mary in Hambledon registration district in Q3 1874. Mary Fryer in 1881 was living with Joyce’s brother, Alfred Cleaver, and his family in Toddington. He was a miller, and in 1871 Joyce had listed her birthplace as Toddington Mill. In 1891, Mary was living as the niece of George or Susannah Pedder in Houghton Regis. Edward and Joyce’s marriage is listed in the Woburn registration district in 1867, though. She was Joyce White. She’d married before. In 1861, she was living as the wife of George White, a plait dealer, in Toddington, where she was born. They married in 1859. Confusingly, she spelt her name Joice, Joice Cleaver. There’s a death record for a George White in 1865 in Woburn registration district, but without a date of birth. Edward Fryer died in 1879 at Hambledon in Surrey. Joyce died in 1925 at Luton. Interestingly, the Fryer family tree gives her mother as Sarah Sophia Bright who was baptised on 22 Sept 1790 in Toddington. This Sarah is a good candidate to be the sister of Thomas Steevens’s second wife Frances. So the Fryers didn’t stay long in The Causeway, and after a promising start, their family broke up. In 1881, The larger part of The Causeway was occupied by the Stratford Family. Edward J Stratford was only 25, but a farmer of 84 acres, employing two men. He and his wife, Marian, had two children, William and Ernest. By 1891, they’d moved away to a farm at Clapham, Bedfordshire. Arthur William Harris variously described himself as a coachbuilder, carpenter, builder and master builder. He’s an employer. His father was a carpenter, also employing someone. Although the house name doesn’t appear on any of these documents, the position of the record in the list gives it away – it’s always the next-to-the-end house in the list of Wits End properties. Next to the end because the last house in Wits End was the smaller part of The Causeway, the part that used to be rented by Charlotte Keating, and throughout this time, that was always occupied as a separate house, unlike in 2012, when it’s been incorporated into the rest of the building as a single property. It’s Edith Mary Harris, aged 9 on the 1911 census, who makes the link with the present residents of The Causeway. Frederick J Turvey married Edith M Harris in 1926. So members of one family have lived in The Causeway since at least 1891. Is this the oldest continuous occupation of a house by one family in Eversholt? The June 2009 issue of About Eversholt reprinted a 1938 cutting from the Luton News and Bedfordshire Advertiser supplied by Jim Turvey. The article celebrate the golden wedding of Arthur William Harris and Mary Harris, who were still living in The Causeway then. The [1938?] article said “Left to Mr Harris by his grandmother, it has been in the family for over a century”. That seems to have been wrong, since it was certainly sold in 1868. “Mr. and Mrs. Harris, who are both natives of the village, have had a family of five sons and two daughters. Two of the boys were killed in the war but the remainder of the family are still alive, and there are seven grandchildren. Both the daughters have married farmers, one living in the nearby village of Wood End, while the other is at Scaldwell, Northamptonshire. One son has a small farm at Wavendon, while the other two live close at hand.” Presumably Edith was the daughter who married the Wood End farmer, who turned out to be Frederick Turvey. The article also says that electricity arrived at the farm in 1938. Arthur William Harris’s grandmother was the Ann Harris who ran the village store. Sam and Ann Harris from the store must have bought The Causeway at some time – maybe even in 1868. They could have been renting it out waiting for a suitable descendant to run it! In his will, William Steevens described Richard Blackford as his “foreman”, and left him £5 and all his shoemaking business. Richard lived in Hills End. 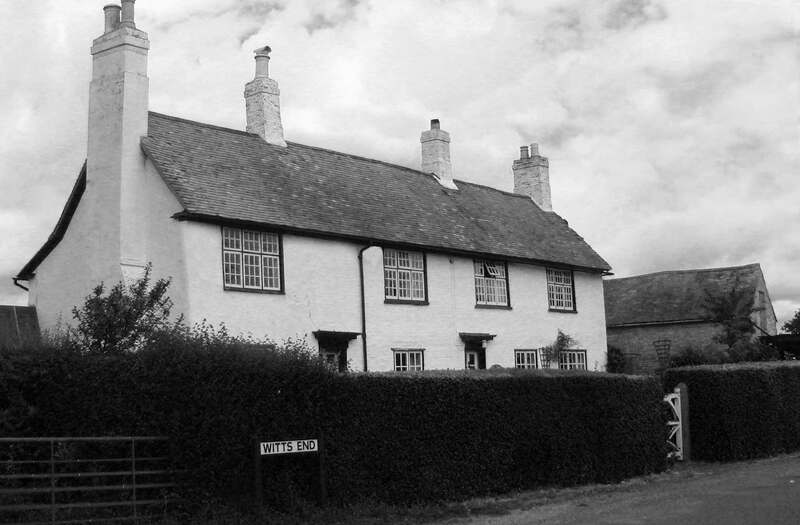 In 1851, the household included Mary, his wife, born in Eversholt around 1801. Richard described himself as a cordwainer, which is a fancy way of saying shoemaker, or possibly a way of saying fancy shoemaker. They also shared the house with William Smith, 25, who’d just married Richard’s daughter Mary Ann, aged 22. Both Mary and Mary Ann were born in Eversholt, so, presumably, Richard moved to Eversholt sometime before 1829 and married Mary here. Indeed, he’s listed in Hills End in 1841 living with Mary and his daughter. In 1861, Richard and his wife have the house to themselves. By 1871, Richard is a widower, still living in Hills End, because Mary had died in 1864. He died in 1875. There’s no monument to the Blackfords in the churchyard today.